Very small and very rich, Brunei has a population of just over 300,000 and has been ruled by the same family-successfully-for over 600 years. The Sultan of Brunei is, depending on the stock market and various international economies and exchange rates, the wealthiest individual in the world. He alone controls the country's vast oil and natural gas reserves and is worth an estimated $40 billion. That said traveling to Brunei is becoming less expensive. In recent years the number of budget accommodations and cheap travel options have increased and Brunei is creating a nice little tourism industry for independent travelers to enjoy. Read: 10 Reasons to Take That Detour to Brunei. Despite the country's economy being based on pillaging the Earth's oil deposits, one of the most popular tourist attractions are the ecological tours. Tours take visitors around the Temburong District and then up the river to Belalong National Park, where travelers can explore a jungle canopy skywalk and a rainforest research center. The main attractions of Brunei though, are in the country's capital. Bendar Seri Begawan is home to a majority of the country's population as well as many of the spiritual sites. 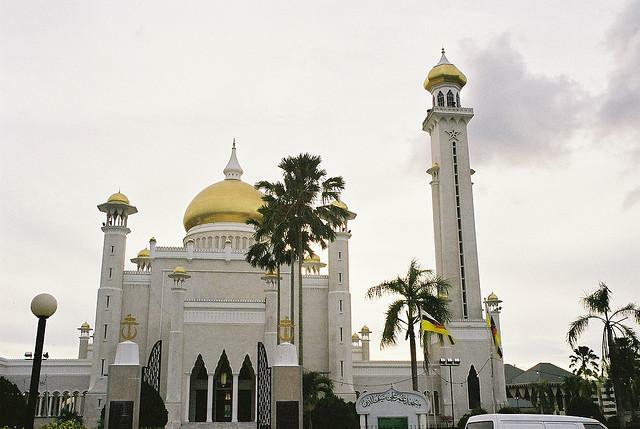 Mosques are friendly places to visit when open to outsiders and there you can often get a first hand look at the Islamic religion as practiced by the people of Brunei. Don't miss the water village. Any boat in the rivers of Bandar Seri Begawan will be happy to give you a tour, haggle the price. For slightly more ask them to take you up river to see the monkeys. Be advised that the whole country grinds to a halt on Fridays during prayer. It's a federal law that all businesses close to allow Bruneian citizens to attend mosque. The capital feels like a ghost town. It's an interesting time to take a walk. Read: Living in a Muslim Paradise: Brunei. Flights to Brunei land in Bendar Seri Begawan (BSB). The airport is the only international terminal in the country. The border with neighboring Malaysia is fairly permeable for certain nationals: US, UK, Japan, Canada and New Zealand citizens do not need a visa. Lodging options in Brunei used to be just like the country: very small and very rich. The expensive hotels and luxury accommodations have given way to hostels and guesthouses (a few at least) that fit the independent traveler's budget a little better.